Another late night! My wife went out to a performance and three roommates who could help with child care stopped by in the evening. By the time all the dust settled, it was after 11p and I had yet to eat. So a quick and easy meal was in order! Tomorrow, the Full Frame Documentary Film Festival, the country's largest such festival, begins. I'll be busy Thursday-Sunday morning-night seeing many great films, some of which I've already previewed. I'll probably be eating near the Festival. I had a box of Road's End Organics' cheddar-style semolina shells on hand, so made them, mixing some bell pepper and spring onion in to the final product, and serving with some Daiya cheddar-style shreds. I also heated an organic Sunshine Burger brand "breakfast" burger and served it topped with tahini and (post-photograph) hot sauce. Simple but filling for me! Tonight's was a relatively quick "convenience" dinner - I'm focused on a few things I have to get done this week before the Full Frame Film Festival (the country's largest documentary film festival with over 100 films this Thursday-Sunday). I had picked up from a Middle Eastern restaurant a prepared can of Zergut brand Bulgarian eggplants stuffed with rice (eggplant, rice, water, tomato, onion, pepper, sunflower oil, tomato concentrate, sugar, salt, citric acid, parsley, black pepper, and bay leaves). It tastes very good right out of the can and doesn't need heating. I had about half of a tube of prepared polenta. I sliced it into six slices, each about 1/2" thick, and sauteed them over medium heat in a cast iron pan for about 4 minutes per side till cooked through. About 2 minutes into the cooking, I added two scallions cut into 3/4" slices, which I served bunched in the center of the polenta. Finally, each polenta round got a dab of Jamaican hot sauce from Asheville's Nine Mile. A salad including avocado half completed the meal. It was easy - and tasty. I preheated a little extra virgin olive oil (the only kind of olive oil I use) over medium heat in a cast iron pan and added the tempeh. I cooked 3 minutes or so, stirring occasionally, then added the mushrooms and jalapeno; a minute later, I added the ramps. I cooked a few more minutes till the ramps and shiitake cooked down a bit, and the tempeh was turning brown, then added the bell pepper and cooked about two more minutes. I enjoy Happy Human's organic spice rubs, and have their "Basic Boost" (garlic, onion, paprika, salt, echinacea, "and other super secret organic spices"). I mixed 1/2 teaspoon or so of it into the vegetables and served. I also prepared some Madagascar pink rice by cooking one part rice to one and 3/4 part water (I think next time I may want to make it a 1:2 ratio as the rice was a little dry) and one vegan salt-free bouillon cube. I brought to a boil then simmered, covered, on low heat for about 20 minutes. I love this tasty, chewy, whole-grain rice that cooks so quickly. and blended on high for half a minute till all was liquified. By the way, I had forgotten till I got a message from somebody, but an article about veganism that I was interviewed for appeared in today's newspaper. It mentions this blog and includes several pictures that I have taken of my dinner plates. I made a stirfry dinner tonight, served with Madagascar pink rice (cooked with a vegan bouillon cube). 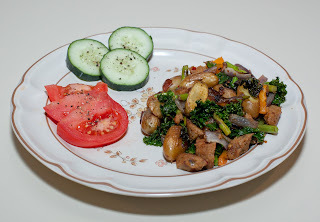 I used broccolini, along with a number of other vegetables like potato, eggplant, quartered Brussels sprouts, red onion, and stalks of Swiss chard, as well as some seitan and a little sprinkling of a tiny bit of salt and more freshly ground black pepper. It was a tasty meal! I had to make a quick dinner tonight as I was attending a screening of a classic Kurosawa film, Ikiru. Over medium-high heat, I sauteed about a dozen Brussels sprouts that I had cut in half; a few minutes into the cooking, I added about a fifth of a red onion, cut into a coarse dice. When the sprouts were lightly browned on the cut sides, I mixed in some brown rice noodles that I had been soaking in hot water, draining immediately before adding to the pan. I cooked for a minute or two, then removed from the heat and mixed in a little freshly ground black pepper and salt. I also heated some edamame (soybeans), then mixed in a little diced ginger, alder-smoked salt, and just a little jerk seasoning. I served with some radish slices for a quick, filling, and tasty dinner.